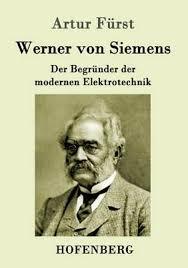 Werner von Siemens was inventor who created the pointer telegraph system in 1847 and began a company that pioneered in new technology. Research papers on famous inventors often morph into projects on major corporations, such as the Siemens Company and its founder, Werner von Siemens. When Werner von Siemens invented the first pointer telegraph system in 1847 he began a company whose history has been built on pioneering new technology and the innovation that is necessary to stay, always, one step ahead of the competition. Siemens has always been at the cutting edge of technological breakthroughs and taking them to the limit; telegraph improvements eventually went transatlantic. Discoveries such as the dynamo-electric principle, which made the mass generation of electrical energy economically feasible, have become routine for Siemens. There are few target markets that Siemens does not cover. As far as industry goes, Siemens participation is again diverse. A list of all industries in which Siemens competes includes Automotive, banks & insurances, healthcare, mechanical engineering, process industries, manufacturing industries transportation & logistics, and utilities. In an effort to isolate the majority of Siemens business, it is safe to say that participation in these industries is almost exclusively in the arena of technologies. Technology is a very dynamic market and the pulse of the economy in general. While there has been some decline in the success of small start up companies in the technological arena, there is little doubt that innovations in technology will continue to control most major industries. This industry continues to subsist in a growth stage and there is little evidence that it is likely to enter a decline anytime soon. There are instances where a portion of the industry may appear to stagnate for the few moments that seem like a century in this ever changing market. And, there is ample competition that will continually attempt to develop innovations that compete with Siemens. However, in this time when so many of the dot.com type technology businesses have failed, people are most interested in dealing with well established firms with a significant record in delivering superior products and services. Therefore, there is every reason to believe that, based on a strong history of innovation and advancement, Siemens will continue to lead the competition in the industries in which it already holds such a strong footing. Media of Mass Communication - The Media of Mass Communication research papers discuss how mass media has changed the way we communicate today. Instructional Technologies - Instructional technology research shows that throughout the 20th Century, many changes have impacted the way that learning is facilitated within the educational system. Paper Masters writes custom research papers on Werner von Siemens and discuss the inventor of the first pointer telegraph system, and a company built on pioneering new technology.